Now supplied in high quality CNC machined enclosure to meet the most rugged of environments. This ARINC 429 to three 0-10Vdc Outputs converter is employed where there is a requirement to extract data from up to three separate user specified ARINC 429 Labels on the same databus and translate it into three separate 0-10VDC outputs. Other output voltages available. The ARINC 429 Labels, SDI, SSM are now user selectable via SMD DIP switches on the PCB. If the user prefers a fixed non-user adjustable version then we can supply this, which will mean that the switch setting are ignored. The ARINC 429 to three 0-10Vdc Outputs converter adapts automatically to high or low speed (12.5/100kHz) ARINC 429 data and the inputs are opto-coupled for electrical isolation purposes. The ARINC 429 to three 0-10Vdc Outputs converter is powered from an external 28 VDC nominal supply (15-72VDC) with an internal current and thermal (102 ºC) fuse. The power inputs are reverse polarity protected. 3 x ARINC 429 to DC: 10VDC @ 25mA. User selectable ARINC 429 Labels using DIP switches. 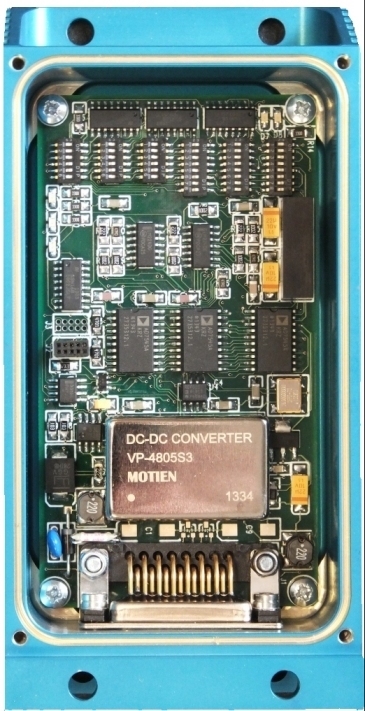 15-72VDC power operation (28V @ 40mA).